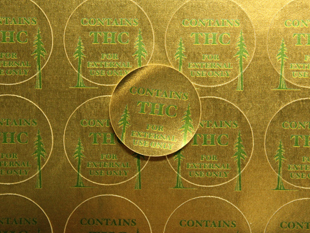 This material creates beautiful metallic printed labels. This material is a very bright material that takes laser toners very well. Acrylic adhesive is for packaging applications and complies with FDA 21 CFR 175.105 for indirect food contact. Prints on Desktop Black and White Laser Printers and Color Laser printers (HP's: Tuff Paper or Transparency Setting)s. This material is RoHS compliant and is compliant with the CONEG Model Toxics Packing Legislation. Want to customize this product into a piggyback, or with a removable adhesive or some other feature? Call us! We can help! 101500 Bright Gold Laser Self Adhesive. Cutting die required (see die pricing for custom shapes). No die required for blanks.